26th September 1915, aged 47. Son of Lt. Gen. The Hon. Charles Wemyss Thesiger, and The Hon. Mrs. C. W. Thesiger; husband of Frances Thesiger, of 13, St. Leonard's Terrace, Chelsea, London. 25th September 1915, aged 34. Son of Robert and Sarah Thickett, of 102, Robinson St., Burnley; husband of Mary Ann Hargreaves (formerly Thickett), of 100, Robinson St., Burnley. "Dear sister, it is with great regret I have to inform you of the death of your husband, who was killed in a charge on the 25th of last month. I know how great your loss is, but you must try and bear it for your daughter's sake. Accept my sympathy, I also feel very sorry for his mother." "I regret to let you know that your husband was killed in action on Saturday, September 25. I thought it was my duty to let you know, as he was in my section. I was just against him when he was killed. You asked for full particulars from his brother Jim, but as he was nowhere near him, he asked me to send a letter letting you know the facts. I was very sorry to see what happened to him, as he was well liked by all his comrades in the company. I hope by the help of God you will be able to bear it, for your own and your daughter's sake." 25th September 1915, aged 35. Husband of Alice Tomlinson, of 79, Healey Wood Rd., Burnley. Father of four children. Prior to enlisting on 23rd November, 1914, James was a weaver at Messrs. Parkinson's Calder Vale Mill. “I have received your letter, and it is with much regret that I have to inform you that your husband, Lce. Corpl. J. Tomlinson is missing. I was very well acquainted with your husband, he having been clerk in England, and he was well respected by the other N.C.O.’s and men. I have tried to ascertain if anyone knew anything about him, but I may say that his platoon suffered very severely, and the few that are left are unable to give any information concerning him. On behalf of the N.C.O.’s and men and myself, please accept our deepest sympathy." "I regret to inform you that Lce-Corp James Tomlinson was killed in the heroic charge made by the 10th Scottish Rifles on September 25th last. We sympathise with you in this matter. I trust that your loss may be lightened by the knowledge that your husband died nobly doing his duty for his country and leading his section towards the German lines. As you may have heard this battalion suffered extremely heavy losses but made a great name for itself in the attack and capture of Loos. Your husband was very popular among the men of this company, and his loss is a loss to the regiment as a whole. Your husband went with the first over the parapet, and advanced gallantly till he met his death. it may comfort you to know that your husband was a splendid soldier, and I deeply sympathise with you and your family. He was a bomber lance corporal and went over the parapet with the bombers and was killed before he reached the German trench." "I learn that your late husband was made a bomber lance corporal in the attack last September. 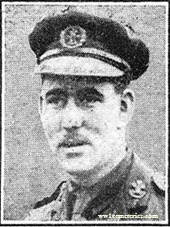 He went over the parapet with the bombers and was unfortunately killed before he reached the German lines. He was shot through the head and died instantly. He was the Quartermaster Sergt’s clerk at Chesledon. He was buried in front of the German lines along with several more of his soldier friends. He went with the first wave over the parapet and advanced gallantly till he met his death. He was a splendid soldier”. 20th April 1916, aged 20. Son of John and Sarah Townsend of The Marsh, Walpole St Andrew, Wisbech. 17th October 1915, aged 22. Son of William and Margaret Trull, of Shadwell, Uley, Dursley, Glos. 2nd March 1916, aged 24. Son of Joseph Henry and Alice Tyrrell, of "Castleknock", Twickenham, Middx. Son of Mr & Mrs Walkden, 81 Shakespeare Street, Padiham, Lancashire. Although initially posted as missing, Matthew's parents had already been told by his friends in the battalion that he had been killed on September 25th. An officer had also written to them telling them that he had buried him along with 30 others. Official notification came in January 1916. Frederick lived at Kings Stanley, Gloucestershire and was the father of three children and 35 when he volunteered having served twice before in the local territorials in Gloucester. His widow lived on for 45 years and never remarried. She also lost her younger brother Archibald Dee who had emigrated to Canada and came back to serve. He died in February 1918 a few miles away from where his brother in law lay. Archibald is buried at Aix-Noulette Communal Cemetery Extension. Frederick served with the 10th Gloucesters and was killed between 2pm and nightfall on 13th October 1915 during a failed attack on the German line just west of the Lens-La Bassee road. He is remembered on the Loos Memorial at Dud Corner Cemetery as he has no known grave. He arrived in France in August 1915 and died just a few weeks later. I am proud to have his medals and this the only picture that survived of him. 11th April 1918, aged 26. Died of gun shot wounds to the stomach and thigh on a hospital ship in Malta, native of Colne, Lancashire, he was a railway carriage cleaner before enlisting. 25th September 1915, aged 38. Husband of Caroline White, of 6, School Rd., Ore, Hastings. He was born in Hastings, East Sussex on 27th November 1877. His wife Caroline was pregnant with her tenth child at the time of his death. 29th October 1915, aged 25. Son of Mr. and Mrs. F. Whitehead, of 5, Council Houses, Shalford, Braintree, Essex. 1st November 1915, aged 35. Fred was a stretcher bearer within the battalion. Prior to enlisting, twelve months earlier, he had worked as a Loom Oiler for Messrs. Hudson, Cotton Manufacturers. He left a widow and two children. Born in Godmanchester in 1894, the son of George and Rhoda Wilkin and was resident in Leagrave, Luton. Beds. 22nd November 1915, aged 35. Husband of Amelia Witherall, of 24, Finch Court, Reading. 13th October 1915, aged 22. Younger son of the late Charles Morris Woodford, C.M.G., and of Florence Margaret Woodford, of Bowshotts Cottage, West Grinstead, Sussex. 11997 Private Lewis Tropman, M. M., 1st Bn. Gloucestershire Regiment, 18th April 1918, aged 38. 6765 Private Peter Ward, 2nd Bn. The Scottish Rifles ( Cameronians), 25th September 1915, aged 38.